If you want to get your neighbors in the Halloween spirit, be sure to engage them in a little game known as "Boo!" It's a popular game in some parts of the country, while in others, nobody has heard of it. You might live in a neighborhood where you think nobody will participate in a round robin type of event as this, but you might be surprised. Sometimes during the holidays people will step up and get involved where before they wouldn't. It's possible, anyway. The game goes something like this, and then will be described in more detail later. You print up a few poems and instructions on colorful paper (likely, orange). You get a treat bucket, or bowl or something and fill it with candy. You can also "Boo" people with candles, Halloween socks, and really whatever your imagination comes up with. 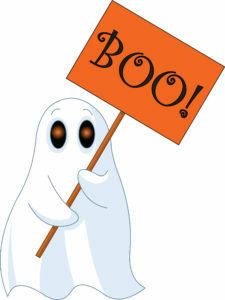 You "Boo" two people at a time, leaving the items anonymously on their doorstep. You leave it with the instructions and the poem and hope they "Boo" other neighbors. Once you are done, you tape up a large "Boo!" on your door so neighbors know not to hit you up again. Specifically, here's how it's done. Start this game around the very end of September or very beginning of October. If you want until everyone is decorated for Halloween, you're probably too late. You want this to spread around the neighborhood and that takes time, so you want to start it right as the season starts (or a little before, perhaps) and just as people are starting to think about Halloween. If you start too early, however, you might be out of luck as far as being able to purchase items goes. You now have been Boo'd, but who would we be? We'll never tell, it's a secret, you see. Then we ran fast, after knocking the door! And spread some "Boos" and neighborhood spirit! Be sure to include a cute graphic of a ghost or something else that looks like it might say "Boo!" You might want to include some details on the flyer about what should be done next, in case you think the poem itself won't be clear enough. Then attach the poem to the goodie bag, basket, whatever you have created, and run out one night dropping your goodies on peoples' doorsteps. If you are just getting this started in your neighborhood, be sure to do more than 2 houses. You might find that some people don't participate and in that case, you want to have "Boo"ed enough people that you will get adequate participation. What you're striving for is a neighborhood full of "Boo" doors by Halloween night!